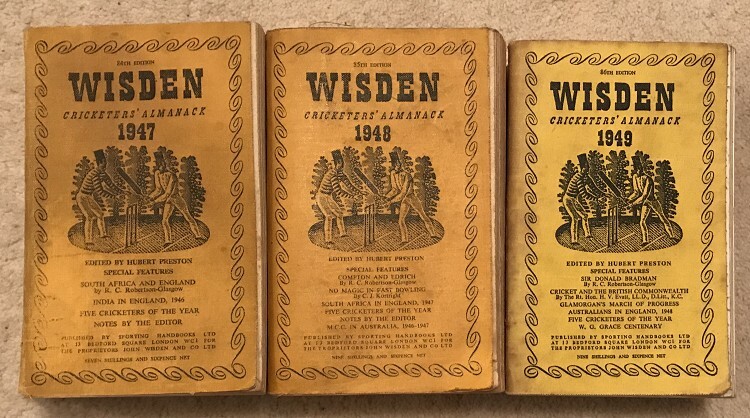 A set of 3 Wisdens, in a run from 1947 to 1949, 3 linen Wisdens. The books are in Good condition, for their years, as these are very hard to find in amazing shape. Easily 7/10s for their respective years. 1947 : Some darkness to the covers, some spine bowing and spine linen coming away a touch, inside nice clean pages, not as brown around th edges as many. 1948 : Similar to the 1947 but lighter covers but the odd dog ear to the first few pages. 1949 : Nice, just some spotting to the page block and covers to note. P&P to the UK is £9 (First Class Delivery & Jiffy Bag) .